I do not say this because I abhor women (although that is how some women will see it), but because of what it is doing and will do, to the worldwide Christianity, to the Church as Christ wishes it to be and to those who are trying to follow the Truth but are being led into confusion. This is a great mistake and a terrible shame. The lady above is an Australian woman bishop and I am sure that she is a good woman and tries her best to serve Christ and those under her care, but she is sadly deluded. The House of Bishops of the Anglican Synod have agreed on an amendment to the proposed legislation in favour of women bishops. It is not good enough for the (orthodox?) Catholic wing because it does not deliver enough on the question of jurisdiction. BUT, as I have said before, this is surely NOT the main problem. You simply cannot have a "communion" where one bishop does not accept the validity of another. That is schism, not unity. You can call it whatever you want and you can fudge as long and as eloquently as you like - it cannot stand. 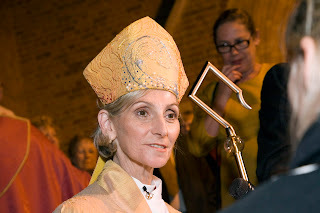 The problems, of course, mount up when you start to think about what might and probably WILL happen; who is going to ensure that a given bishop has not been ordained by a woman bishop? How on earth are they going to police this arrangement? Come to that, how on earth is any congregation going to know - with certainty - that a male priest has not been ordained by a woman bishop? In such parishes visiting priests will have to show ordination papers like passports are used to enter another country. THIS IS NOT - IN ANY WAY - UNITY. The Anglican "communion", whatever it was before, is NOT a communion. St. Ignatius of Antioch said, "Where the bishop is, there is the Church"....which bishop? Which church? Surely the time has come to face the pain of truth and admit that, now, the game is up. There may be "extra time" in this game, but the outcome is already known. Has the time come at last for those who do not accept women bishops to leave the pitch? It'll all be over soon, for all of us, either through revival or the Lord's return. Fatima gave us it's warnings........... and also it's promises if we adhered appropriately. (the miracle being witnessed by Catholics, Protestants and atheists). It's still not too late to change. et la Vierge Marie, vous la détestez ?